Our Paris Night Tours or Paris Illumination Tours Include: Our Paris Illumination Tour, a night tour, includes private transportation to and from your hotel, the services of your private guide, taxes, tolls and parking. Book our Paris night tour and find out why Paris is known as the “City of Lights.” This evening driving tour of Paris illuminated, will take you to the city’s most spectacular monuments and historical sights, which take on a magical, dramatic appearance as they are lit up at night. Enjoy this romantic guided night tour of Paris and discover the other face of Paris at night with its gorgeous monuments and bridges with our English-speaking driver-guide and find out why Paris is also called “the City of Lights”: See The Eiffel Tower, Trocadero, Champs Elysées, Arc de Triomphe, Notre Dame, Hotel de Ville, Louvre, Opera Garnier, Place de la Concorde, Madeleine, Pont Alexandre III. NOTE: We make several stops in this tour and the stops may vary based on traffic conditions, time at hand, and guide’s personal choices. 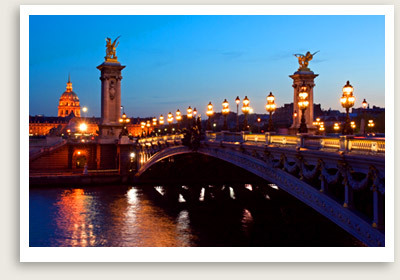 Possible stops: Trocadero facing the Eiffel Tower, the Opera Garnier, close to Alexander III bridge and more.